I love the first week of Me Made May. It's all excitement, inspiration and good vibes. My me made wardrobe is not yet at a point where I can put together a full months worth of outfits that I feel good about. At the moment work is hectic, my personal life is hectic and studying is taking up much more time than I thought it would. I need my clothes to help me feel good and well put together and I don't feel like it's happening at the moment, but I'm not going to give up. Alright, enough navel gazing, lets take a look at what I wore. 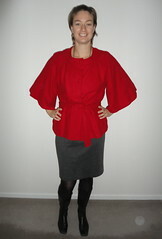 Wearing Simplicity 3686 slim fit pants, self draft top and Simplicity 2443 jacket. Crazy dogs are optional! Wearing Simplicity 2451 skirt and Butterick 5627 top. This outfit looks much better with the black cardigan and shoes that I took off! Wearing another version of Simplicity 3686 pants and Simplicity 2443 jacket. Wearing Simplicity 3538 jacket (pre-blog) and BWOF 2/2007 105b t-shirt (un-blogged). Wearing my japanese balloon top and me made undies. Only wearing one me made item today and it's my stripey Kwik Sew 3740 top. Favourite outfit of the week goes to day 11, I do love that jacket and the t-shirt fabric is soft and beautiful to wear. My least favourite is probably day 10, it needs a different top and day 9 looked better when I had my black cardigan on - the proportions look wrong when I take it off. I think week three is going to be even tougher! Ok, so it's a very corny blog title but it's the best I can do at the moment. I hope I don't have another week like the last for a very long time. I was so exhausted on Friday night that Wade gave me a 10pm curfew! I was desperate to spend some time in my sewing room and I had very limited brain capacity so I decided to make myself another pair of Amy Butler Lounge Pants. I bought this koi print flannelette at Spotlight recently with the lounge pants pattern in mind. There's nothing nicer than a pair of cozy comfy flannel pj pants on a cold day. The only thing I did differently to last time was to add an extra 2 inches to the length and leave off the hem bands ( I haven't touched the coat I mention in that post, it's still waiting to be sewn up). These pants are designed for comfort, not figure flattery (on me anyway), but I love them. The fabric makes me smile, they feel terrific and I finished them before my imposed bedtime! Now I just need to make a pj top to go with them. Whew. I've survived week one of Me Made May and already I've discovered that my wardrobe hasn't changed much, but my tastes have! My favourite ensemble is day 1 - those pants are worn once a week and the variety of colours in the silk top means it can go with so many things. And it's silk. enough said. My least favourite would be day 6 - there's nothing particularly wrong with it, it just doesn't make me feel good. Generally I wear that as a casual top so I just didn't feel very 'put together' for work. Most inappropriate outfit goes to day 3 - that dress is far too short for me to wear to work, but I did it anyway and pretended it was ok because it was Friday. Here's the outfits with links to the item's original blog posts. Day 1: Simplicity 3686 pants and McCall's 6519 top. Day 5: Ottobre Woman 2/2008 #16 leggings and McCall's 5630 shirt. Day 7: Butterick 5627 and a brand new pair of (as yet unblogged) Ohhh Lulu Lola undies. During Paige's recent hospital stay we spent a little bit of time looking at projects on Pinterest. This one really caught her eye, so I thought we'd do our own version. I used the slim fit style from Ottobre Design 301 (The best t-shirts) pattern in a size 140. I added an extra 8 inches to the bottom and scooped an extra inch out of the front neckline (it was really high last time I made it). This time I also used contrast bands to hem the sleeves. The only thing I'm not 100% happy with is the slight wave in the neck band, but for a nighty it's not a big deal. The fabrics are all great cotton lycra blends from Spotlight several years ago. Unfortunately Spotlight don't seem to sell it anymore which is a real shame because it's decent quality at a reasonable price. At the moment I'm only able to sew in about 20 minute sessions so it took 3 nights to make this - one night to cut out, one night to do the applique and one night to put it all together. Paige is happy with the final result and I just loved getting to spend a little time in my sewing room. Expect a few more kids projects to show up here, Paige has shot up several inches since last winter and is in desperate need of new clothes. It's the first day of Me Made May 2013! Despite being completely shocked that it's actually May (how did that happen?) I'm really excited to be taking part in MMM again. I often find it a struggle towards the end of the month so we'll see how it goes this time. May looks like it's going to be slightly less hectic than January - April, so I should be able to eke out a little more time in my sewing room. In fact I have a little project on the go and I love the way it's shaping up. I, Robyn of Sew Love Red sign up as a participant of Me-Made-May '13. I endeavour to wear a minimum of two handmade garments each day for the duration of May 2013. And today's me-made items are Simplicity 3686 pants (blogged here) and McCall's 6519 top (blogged here). Not sure what's going on with the angle of the photo, but that's what happens when your 13 year old snaps a quick photo as you're rushing out the door and you're running late. Thank you, thank you, thank you for all your kind thoughts and well wishes for Paige. She's recovering beautifully and to look at her now you'd never know she'd been sick. My biggest challenge at the moment is trying to get her slow down!